I like to call my field of research ‘Paleobiogeochemistry' because I am fascinated by biological processes in deep time such as the origin of life, mysterious ecosystems in Earth's earliest oceans and environmental cataclysms that may have spawned the emergence of complex life. To find clues to ancient ecosystems, I study molecular fossils of biological lipids (biomarkers) that can be preserved in sedimentary rocks for billions of years. In our laboratory at the Research School of Earth Sciences, we specialize in the detection of traces of biogenic molecules using the most sensitive techniques available. The Neoproterozoic, 1,000 to 541 million years (Myr) ago, was the most tumultuous period in Earth history. It saw the greatest perturbations of the carbon cycle, the most massive ice ages (“Snowball Earth” events), a rise of atmospheric oxygen, the advent of animal life followed by the rampant diversification of animals in the ‘Cambrian Explosion’. The diversity of shapes and forms of single-celled eukaryotes – the ancestors of all animals, plants, protists and algae - also massively increased around 800 million years ago, and there may be links between these intriguing evolutionary events and the large carbon isotopic excursions that characterize this time. The oldest of the Neoproterozoic excursions is the enigmatic Bitter Springs Stage Anomaly (BSSA), dated to ~825 Ma. We investigated biological and environmental changes across the Anomaly by studying redox chemistry, sedimentology and molecular fossils of a particularly well preserved section in central Australia. Over ~200 meters of carbonate stratigraphy, the BSSA records a negative carbon isotope shift from +5‰ to -4‰ and back to +5‰. The isotopes recovered to positive values when the environment changed from relatively deep, partly stratified and anoxic waters to very shallow pools surrounded by exposed land. Intriguingly, molecular fossils recovered from the deep waters of the negative excursion contain the lipid remains of anaerobic predatory eukaryotes, possibly the oldest genuine biomarker signal of modern eukaryotes in the geological record. The anaerobic predator signal diminishes at the end of the carbon perturbation and is replaced by the emergence of what we interpret as the oldest known signal of modern oxygen-breathing eukaryotes. The diversification of eukaryotic fossils around 800 million years ago has been attributed to an expansion of eukaryotic algae. However, the biomarkers that emerge at the dawn of the Bitter Springs Stage Anomaly have an unusual primitive distribution, indicating that the shallow pools were not inhabited by photosynthetic algae but by heterotrophs, organisms that consume carbon and are more akin to amoebae. Figure 1. 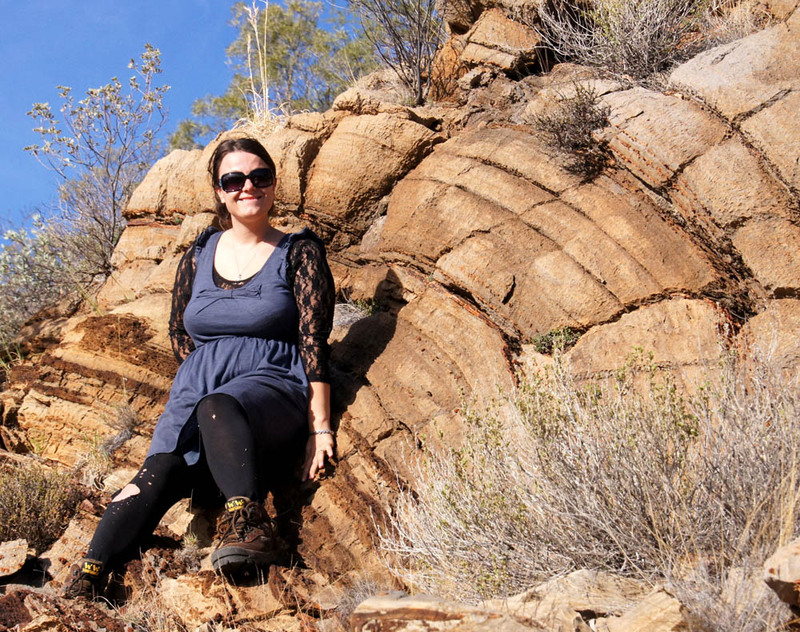 Amber, the PhD student whose thesis is based on this work and who made the amazing discoveries, in front of a giant stromatolite (microbial mat) of the ~825 million year old Bitter Springs Formation near Alice Springs. (1) Pawlowska, M. M., Butterfield N. J. and Brocks J. J. (2013) Lipid taphonomy in the Proterozoic and the effect of microbial mats on biomarker preservation. Geology, 41:103–106. Based on new technology, we present a revision of the Precambrian biomarker record, revealing unusual patterns and offering a controversial hypothesis about their origins (Brocks corresponding author). (2) Narasingarao P., Podell S., Ugalde J. A., Brochier-Armanet C., Emerson J. B., Brocks, J. J., Heidelberg, K. B., Banfield, J. B. and Allen, E. E. (2012) De novo metagenomic assembly reveals abundant novel major lineage of Archaea in hypersaline microbial communities, The ISME Journal [Nature family journal] 6, 81-93. We report the discovery of an entire new class of organisms, the ‘Nanohaloarchaea’. Brocks is the Australian CI of this international project investigating the microbiology of saline Lake Tyrrell in Victoria. (3) Brocks J. J., and Banfield J. (2009) Unravelling ancient microbial history using community proteogenomics and lipid geochemistry. Nature Reviews Microbiology, 7, 601-609. In this invited Opinon article published in a Nature family journal, we describe our vision about the future of biomarker geochemistry in light of the environmental genomic and proteomic revolution. (4) Rasmussen B., Fletcher I. R., Brocks J. J., and Kilburn M. R. (2008) Reassessing the first appearance of eukaryotes and cyanobacteria. Nature, 455, 1101 - 1104. We pioneer the measurement of organic carbon isotopes at the micron scale and open the possibility that biological oxygen production may have evolved as late as 2.5 billion years ago. (5) Brocks J. J., Love G. D., Summons R. E., Knoll A. H., Logan G. A., and Bowden S. A. (2005) Biomarker evidence for green and purple sulfur bacteria in an intensely stratified Paleoproterozoic sea. Nature, 437, 866-870. At 1.6 billion years, we describe the oldest clearly indigenous biomarkers. They describe an unusual, entirely microbial ecosystem dominated by green and purple sulfur bacteria, leading to the ‘Purple Ocean’ hypothesis. (6) Brocks J. J. and Summons R. E. (2004) Sedimentary hydrocarbons, biomarkers for early life. In Treatise on Geochemistry, Vol. 8 - Biogeochemistry (ed. H. D. Holland and K. K. Turekian), pp. 63-115. Elsevier. The Treatise on Geochemistry in 10 volumes is regarded as the most important reference work in geochemistry. All contributions are by leaders in the field and were by invitation only. (7) Pearson A., Budin M., and Brocks J. J. (2003) Phylogenetic and biochemical evidence for sterol synthesis in the bacterium Gemmata obscuriglobus. Proceedings of the National Academy of Sciences,100, 15352–15357. Using a pioneering, combined biomarker-genomic approach, we demonstrate that sterol biosynthesis was laterally transferred between bacteria and eukaryotes early in Earth history, a discovery of deciding significance for molecular and evolutionary biology. (8) Brocks J. J., Buick R., Summons R. E., and Logan G. A. (2003) A reconstruction of Archean biological diversity based on molecular fossils from the 2.78 - 2.45 billion year old Mount Bruce Supergroup, Hamersley Basin, Western Australia. Geochimica et Cosmochimica Acta,67, 4321-4335. Most downloaded research article in Geochimica et Cosmochimica Acta (GCA) in the year 2004 in discipline organic geochemistry. GCA is the highest ranking geochemical journal. (9) Brocks J. J., Buick R., Logan G. A., and Summons R. E. (2003) Composition and syngeneity of molecular fossils from the 2.78 - 2.45 billion year old Mount Bruce Supergroup, Pilbara Craton, Western Australia. Geochimica et Cosmochimica Acta, 67, 4289-4319. Second most downloaded research article in GCA in the year 2004 in discipline organic geochemistry. Possibly the most detailed investigation of a Precambrian (> 542 Myrs) hydrocarbon assemblage. (10) Brocks J. J., Logan G. A., Buick R., and Summons R. E. (1999) Archean molecular fossils and the early rise of eukaryotes. Science, 285, 1033-1036. Seminal work that initiated the renewed search for the oldest molecular fossils of early life. Selected by Science as a top-ten ‘Scientific breakthrough of the year’ (Science, 286, p. 2239).